Dr Jon Heras DescriptionA quantum dot is a semiconductor nanocrystal, and their high quantum yield has led to their use as artificial fluorophores in biological systems. They are tagged to a particular molecule, and then their movement and concentration can be detected optically. Quantum dots are superior to traditional organic dyes because of their tremendous brightness and their stability (against photodestruction). They have been used to acquire three-dimensional confocal microscopy images, and the real-time tracking of molecules and cells over extended periods of time (up to four months). Here, a fragment of foreign DNA (red), which has been digested by cellular machinery, has been brought to the surface of the cell by the HLA receptor (purple). The InAs crystal (orange) is being used to probe the immune system. 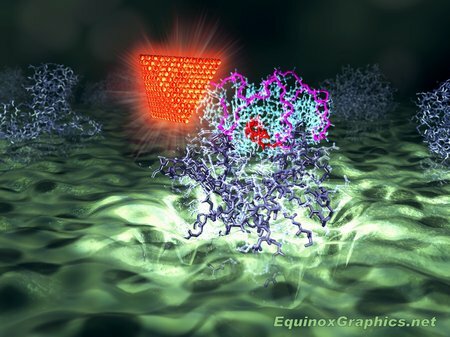 The Quantum Dot is tagged to a RNA aptamer (magenta and cyan), and this binds to the piece of foreign material (red). This concentrates the Quantum Dots in areas where this foreign material is found. [The aptamer is in a sense taking the place of a white blood cell in ‘reading’ the bound ligand (red)].